He was involved with many different action games as a programmer at a major game company. He and some co-workers started Treasure in 1992. They’ve been continually developing games since then, primarily focusing on action and shooting games. Why did you develop your maiden work, Gunstar Heroes, for the Mega Drive? 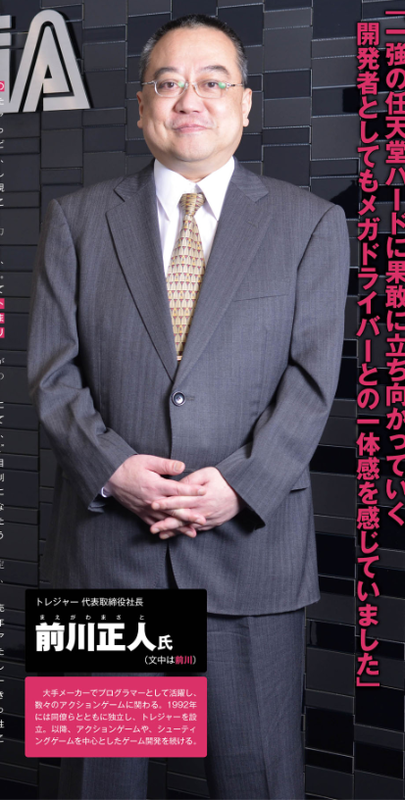 (Maegawa) Even before starting the company, I wanted to develop original games in my own particular way. I felt that the Mega Drive at that time had an environment in which I could freely create original games, and so I decided that I’d develop for the Mega Drive after I started the company. It did feel that way. In case you’re wondering why I asked that, if you would have released Gunstar Heroes on the Super Famicom (which was more popular at the time), I was thinking that it probably would have sold better. (Maegawa) The Super Famicom had a lot of very popular titles. Even if we’d released it on there, there’s a good chance that it would have just gotten lost in the pile, given how unknown we were (Laughs). I think a big part of why it stood out is because we released it on Sega hardware. And since I started Treasure with the ideal of “Making games that we like over games that sell”, having an environment where we could make the games we liked without thinking about profit was very important. Were you actually able to make games in the particular way that you wanted to? (Maegawa) Treasure made games under the Sega brand name, but we were able to make them pretty much in our own way, without anyone meddling in the games themselves. I didn’t realize this until later, but publishers don’t typically give you that much freedom in making games for them (Laughs). And being a private company back then was pretty typical. But we were able to get permission to put our company’s name on the game, and we were also able to handle our own publicity activities….it was a wonderful environment that really fit with Treasure’s ideals. So your determination back then proved to be correct. (Maegawa) I’d say so. As developers there was a part of us that got passionate about the idea of “The Mega Drive boldly standing up against the almighty Nintendo’s hardware”, along with the user-base (Laughs). There was a sense of unity between developers and “Mega Drivers” (passionate Mega Drive fans). And at the time, I thought that moving on to the Sega Saturn from the Mega Drive was the right thing to do. Why was Gunstar Heroes was your debut game in the first place? (Maegawa) The concept for it in the planning stages was to be a really dynamic action shooting game, but I really just wanted to try making a game in a genre that I was good at, with everything I had. You could say that I wanted to win the game with a straight pitch, not a curve-ball. Each member of the development team has memories of doing whatever they wanted in making the game, since the whole thing was themed around “Exhilaration” and “Anything Goes” (Laughs). At any rate, we put everything we wanted into the game, and Gunstar Heroes is what came out. Speaking of Treasure games on the Mega Drive, I can’t leave out Yu Yu Hakusho: Makyou Touitsusen. It’s very highly regarded within the “character game” genre, but what sort of concept did you have in mind when developing it? (Maegawa) Actually, Yu Yu Hakusho: Makyou Touitsusen wasn’t originally a game based on Yu Yu Hakusho. It was originally developed as an original game that we called “Axion”. (Maegawa) Yes. With “Axion” all of the basic systems: Multi-plane fighting, easy to execute super moves, using a separate button to guard, etc. were already developed. After some conversations, we just changed the characters to those from Yu Yu Hakusho. Of course it was also necessary to make it a game that brings the individual character quirks to life, and that part of things took a considerable amount of re-development. But I think that a lot of the “character games” back then began with the concept of turning the original source material into a game. And since Yu Yu Hakusho: Makyou Touitsusen was made with the exact opposite approach, I think maybe that’s why it has such a good reputation. Upon hearing your story, I agree with that opinion. By the way, are there any other Mega Drive titles that you’re particularly envious of as a developer? (Maegawa) I wouldn’t say that I’m envious of them, but games like Sonic The Hedgehog, Shining Force, and Land Stalker are all well known Mega Drive games that are still fun to play now. I think that games like those were a big part of why we wanted to make games on the Mega Drive. In developing software for it back then, what did you feel that the Mega Drive hardware particularly excelled at? (Maegawa) The biggest allure was that the Mega Drive used the MC68000 as its main CPU. This CPU was able to do some pretty interesting things that the Super Famicom couldn’t do. And because of that we were able to give the multi-jointed characters that very distinct style of movement. If I were to name some faults, it would be the small number of colors and amount of RAM. We solved those issues by establishing color differences between the backgrounds and characters, and programmatically attaching the separately created upper and lower halves of the minor enemies. At any rate, we had fun figuring out how to implement those things. We also used the horizontal and vertical scrolling effectively to simulate rotation effects that the Mega Drive didn’t actually have. Taking the stance of “We’ll just figure it out” is still pretty amazing. (Maegawa) I think one of the big allures of the Mega Drive was being able to express things in all sorts of different ways, depending on the idea. To reference my earlier example of rotation effects: If the hardware itself had the ability to do that, like the Super Famicom, we’d most likely have talked about how to effectively use that rotation effect as developers. But since the Mega Drive hardware didn’t have it, it turned into us thinking about how we implement a rotation effect. It was a lot of fun, just in a different way. I see. Treasure’s specialty is really knowing how to put in an effort. That’s very hard-core (Laughs). I think those games are so well loved because they were made by people like that. (Maegawa) Gunstar Heroes was ported to different platforms later on, and I’m very grateful for that. Because the concept and the actual game itself are the most important things about a game. A lot of older games were lacking in terms of visuals, but that limitation allowed people to specialize in making particularly interesting games. I think that’s why older games are looked at as interesting, even independent of retro culture. And that makes me very happy. For our final question, when the Mega Drive Mini was announced for release sometime next year, please tell us how you felt. (Maegawa) Honestly, it’s a pity that the Mega Drive Mini will be released next year, and not this year, which is the 30th anniversary. I was thinking that they should definitely release an item like this, and I was really very happy when I heard the news that they were going to. I can’t help but thinking it would have been great if you were able to put the actual game cartridges into it and play them…but the original Mega Drive is a durable console, and mine is still working. So this will be just fine until it breaks (Laughs).